Although it is not traditional for a chief bridesmaid or matron of honour to make a speech at the wedding, as weddings get more original and less formulaic, it is becoming increasingly popular. 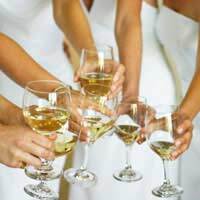 It is more common for a chief bridesmaid or matron of honour to make an upbeat, funny speech at the hen night or bridal shower, which is the perfect opportunity to regale your fellow hens with tales of how you met the bride, tales about your shared friendship and how pleased you are to be asked to be the chief bridesmaid. Do be careful not to gloat, or make other people feel they are not included, especially as they will have their own relationship with the bride and may have spent a lot of money to be part of the hen night. If you have decided to make a speech at the wedding, give yourself plenty of time to think about your friendship with the bride and what she means to you as a friend. If you are making the speech on someone else’s behalf – for example, if the father of the bride does not have English as a first language and has requested that you speak on his behalf – you will need to follow the tips and templates for that person’s speech, so look at the appropriate article on this site. Remember to keep the speech brief – the more people make speeches the more fidgety the guests get, especially if there are young children invited. Start your speech by mentioning your relationship with the bride. Say how beautiful the bride looks and perhaps something about how much preparation and beauty treatments have helped! Example: I am so proud and pleased to be speaking to you today as matron of honour for Jessica and new husband, William. Jessica and I have been friends for over twenty years, since we first met at ballet class. Even though she was far better at plies, we became fast friends and have been important to each other ever since. I have to say how beautiful you look today, Jess and you should do after all the hours we spent at the beauty salon! Although there is no real protocol, it is appropriate to thank the best man and the ushers for doing their job well. Example: I am sure Jessica and William – the new Mr and Mrs Stone! – will be happy for me to thank the best man and ushers for doing a great job in getting everyone to the right place at the right time. Although (best man) Jeremy was cutting it pretty fine this morning, from what I’ve heard! Also, both Jessica and William’s parents have been terrific in the run up to the wedding, offering considerable help, support and blank cheques! Let’s toast them all. You can finish your brief speech by making a heartfelt toast to the future happiness of the bride and groom. You do not need to be overly sentimental as plenty of other people who will be making, or have already made speeches will have fulfilled this role. Example: I shall keep my speech short and sweet by saying thank you to everyone for being here today. I’m certainly ready for my promised first dance with Jeremy – it’s traditional, Jeremy, so get your dancing shoes on! Let’s say a toast to Jessica and William and wish them every happiness for a long and healthy married life. Cheers!